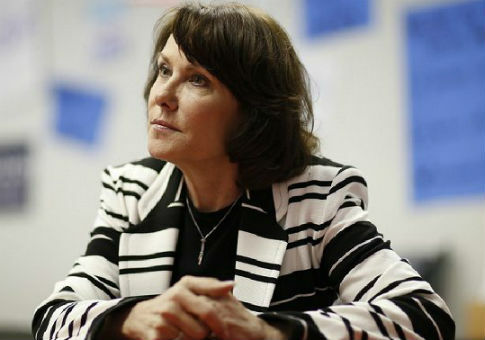 Rep. Jacky Rosen, the Democrat vying to unseat Republican senator Dean Heller in Nevada, launched an attack on her opponent for accepting contributions from the insurance industry on Thursday—only days before being scheduled to attend her own $5,400-a-head fundraiser hosted by one of California's largest insurance providers. In an op-ed published in the Reno-Gazette Journal, Rosen lambasted Heller for having voted to repeal and reform the Affordable Care Act since joining the Senate in 2011. Rosen, who admitted the law "is far from perfect" and requires significant reforms, accused Heller of lying in television ads where the senator promises to fight "to protect preexisting conditions." "After attacking the ACA's coverage protections for preexisting conditions for almost a decade, how does Senator Heller expect anyone to believe what he's saying?" Rosen wrote. In her op-ed, Rosen attempted to paint the incumbent as "caving to corporate special interest" through his votes against Obamacare, citing campaign contributions Heller has received from the "insurance industry" as proof. "Of course, it's no wonder Senator Heller is caving to corporate special interests—he's taken half a million dollars in campaign contributions to date from the insurance industry," she wrote. Heller, for his part, has defended his record on health care by arguing the tax increases and mandates in the Affordable Care Act have adversely impacted Nevada's most vulnerable citizens. The senator has also been central to efforts to reform the nation's health care system, proposing an Obamacare alternative in July 2017 alongside his colleagues from South Carolina and Louisiana. The proposal, which sought to transform Obamacare into a "federal grant program that provides states with the money and flexibility needed to determine how to best cover health care costs," failed to make headway in the Senate. Rosen's attacks on Heller come as she plans to journey to San Francisco on Sept. 17 for a $5,400-a-head fundraiser hosted by Blue Shield of California, one of the Golden State's largest health care providers. To date, the political action committee affiliated with Blue Shield has raised over $250,000, with the overwhelming majority of funds being spent to bolster members of the Democratic Party. Listed as a cohost for the fundraiser is Blue Sheild vice president Gary Cohen, who leads the organization's government affairs and lobbying division. From 2010 to 2014, Cohen served in the Obama administration as director of the Center for Consumer Information and Insurance Oversight, a federal agency charged with "helping implement" the Affordable Care Act. In that position, Cohen "worked with senior Obama administration officials, state insurance regulators, health plans, and other stakeholder groups" to establish Obamacare's "federal and state [insurance] marketplaces," according to Blue Shield's website. Serving alongside Cohen as cohosts are Lorna and Wade Randlett, a San Francisco power couple who have long underwritten progressive candidates and causes. As noted by the Center for Responsive Politics, the Randletts raised over $500,000 for President Barack Obama's successful reelection effort in 2012. Contrary to Rosen's attacks on Heller, financial disclosure forms note Rosen's campaign has heavily benefited from the health care and insurance industries. The Democrat has raised nearly $300,000 from individuals and PACs affiliated with the health industry. This entry was posted in Politics and tagged 2018 Election, Democratic Party, Jacky Rosen, Obamacare, Senate. Bookmark the permalink.